Each year the United States Postal Service (USPS) releases new holiday-themed postage stamps for the billions of Christmas cards, letters, and postcards sent by Americans each holiday season. In addition to the new stamps they also continue to offer a handful of well-loved postage designs from previous years. The stamps are issued as "forever" stamps and are valid postage for all domestic one ounce letters. (Sending postcards or heavier letters? — See all postage rates for 2018) All are available in books of 20 stamps. None of the designs are available in rolls of 100 stamps. This Santa-themed set features 4 different illustrations of Santa Claus by artist Haddon Sundblom. 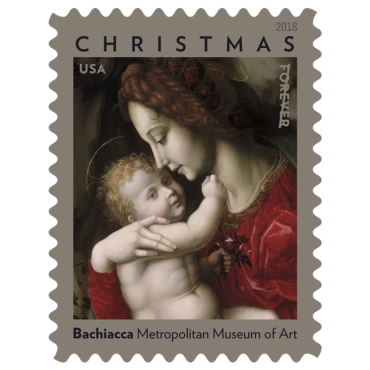 This Christmas stamp depicts the Virgin Mary holding the Christ child. It is taken from Bachiacca's painting 'Madonna and Child' from the 1500s. 'Birds in Winter' features four beautiful birds on snowy white backgrounds. Perfect for non-holiday mail all winter long. 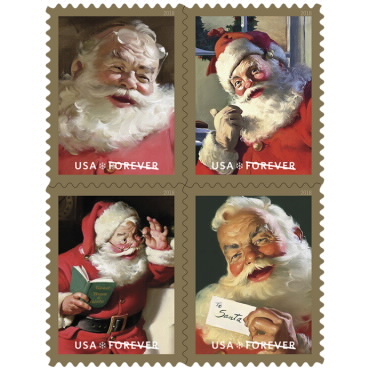 The Christmas-themed stamps below were issued in previous years but are still available for purchase and use while supplies last. These Christmas carol-themed stamps feature lyrics from legendary holiday songs along with iconic Christmas iconography. 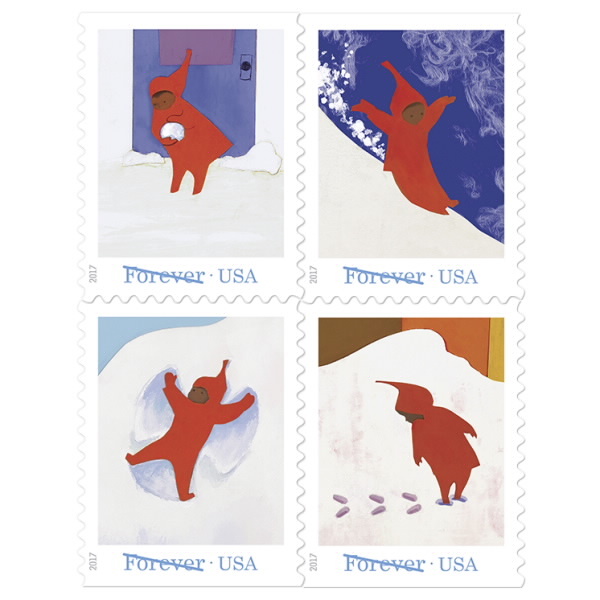 This series of snow-themed stamps celebrates 'The Snowy Day'—a story by Ezra Jack Keats. 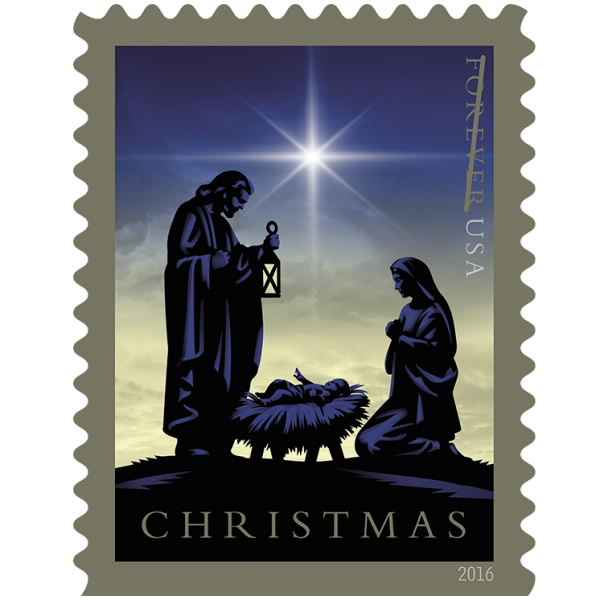 This simple-yet-elegant nativity stamp features a depiction of the birth of Jesus Christ in a manger. Originally debuted in 2016, this Madonna and child depiction features the Virgin Mary and the Christ child. The painting was done by an anonymous artist in the 1400s. The U.S. 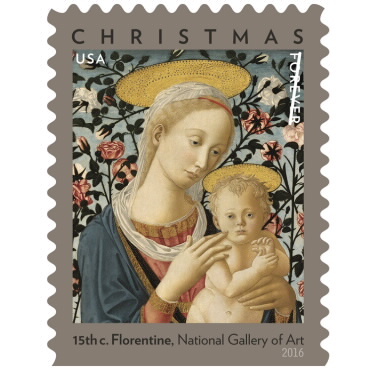 Postal Service only offers a handful of designs, but Minted has over 3,000 Christmas-themed postage stamps! Choose from a collection of holiday themed designs or personalize any stamp with your own initials or name. You can even create your own stamp to match your Christmas stationery perfectly. Find the perfect stamp for your holiday cards! Mailpiece 1 oz Envelope 2 oz Envelope Postcard "Non-Machinable"
The amount of postage needed for one ounce letters (most mail) is $0.50. 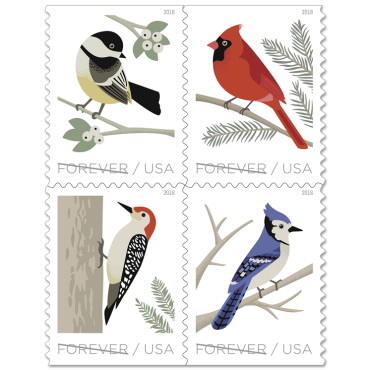 Any “forever” stamp is valid postage for 1oz mailings no matter when it was purchased. There is a proposed price change that will take effect in January of 2019. Custom postage stamps from Minted cost a bit more in addition to the face value of the stamp but allow you to personalized your postage with your name, initials, photos and more. 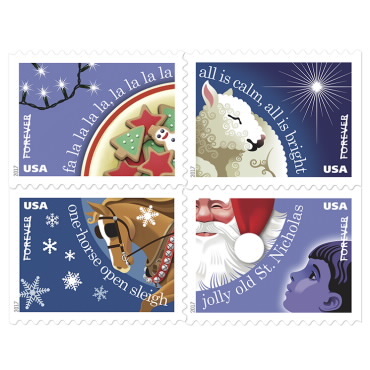 The USPS has no holiday-themed two ounce stamps (Currently $0.71). However ALL of Minted’s 3,000+ custom postage stamps are available as 2 oz Christmas stamps. Simply choose the 2oz rate ($0.71) when you place your order. The USPS has no Christmas postcard stamps (Currently $0.35) featuring holiday themes. Thankfully ALL of Minted’s 3,000+ custom Christmas postage stamps are available as Christmas postcard stamps. Simply choose the postcard rate ($0.35) when you place your order. Square envelopes are considered “non-machinable” by the USPS and require the base postage rate plus additional postage (currently $0.21) to be mailed. 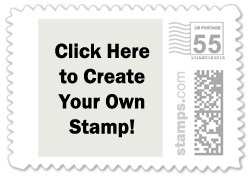 So to send a one ounce square envelope you’ll need a $0.71 stamp ($0.50 + $0.21). 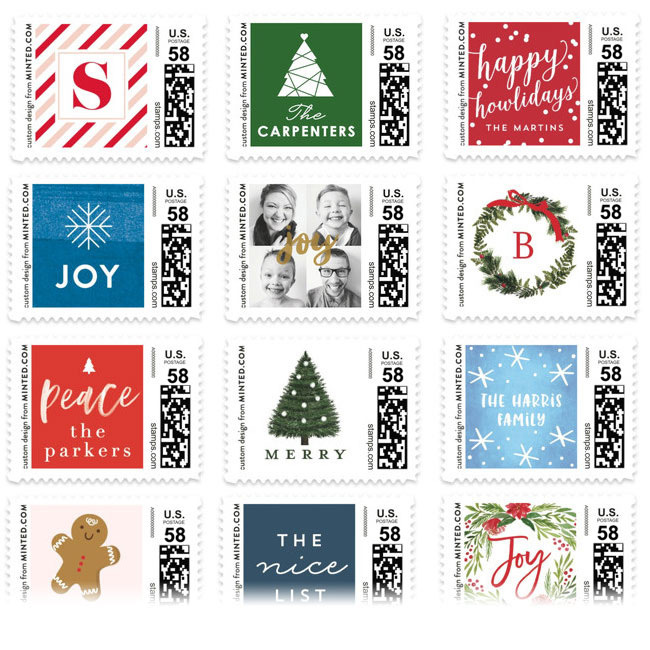 There are no $0.71 stamps with holiday themes from the USPS but Minted offers 3,000+ custom Christmas stamps with a face value of $0.71 which is a great way to keep your holiday cards looking festive on the outside, too.